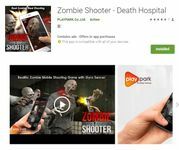 Subject: What makes Zombie Shooter – Death Hospital an awesome Zombie Game? The dead aren’t the only things rising in Zombie Shooter: Death Hospital. The highly addictive game had its soft launch last week and it continues to improve and grow more popular. Let’s put some numbers here if you aren’t too convinced to start playing yet. Zombie Shooter: Death Hospital now on the Google Play Store. It has an amazing 4.7 star rating, from 12 different reviews. Looking at the installs, it seems more than 100 people have started playing the game, who knows, soon it may even be in the thousands. You don’t want to be the only person not playing this game. If you love a challenge, if you love horror, or if you love shooting zombies, then this game is the perfect one for you. As the updates continue to roll out, the game will only grow to improve. Let us rise up survivors to combat the oncoming zombie plague. This will be a good lesson in survival, the zombie apocalypse could come at any time. It’s better to be caught prepared than to be caught sleeping. I just can’t get enough about this game. The recent updates are improving some of the earlier flaws of the game. SO WHAT ARE YOU WAITING FOR? PLAY THE GAME!!! And tell me once you do so we can talk about it some more.